Department of Pharmacy, Primeasia University, Banani, Dhaka - 1213, Bangladesh. ABSTRACT: The present study was undertaken to provide the rationale for the use of Terminalia bellirica as an anti-inflammatory agent using carrageenan-induced inflammation and antiulcer agent using ethanol-acid induced gastric mucosal injury model in the Swiss albino rats. The anti-inflammatory activity of the extract was evaluated using carrageenan (1% w/v) induced inflammation model at doses of 50, 120 and 300 mg/kg, p.o while using ibuprofen (20 mg/kg, p.o) as the standard drug. On the other hand, the antiulcer activity of methanolic extract of T. bellirica leaves at the doses of 100, 250 and 500 mg/kg, p.o. were examined against ethanol-acid induced gastric mucosal injury in the Swiss albino rats - keeping omeprazole (20 mg/kg, p.o.) as the reference. The rats were dissected, and their stomachs were macroscopically examined to identify hemorrhagic lesions in the glandular mucosa. Further, the histopathological changes of paws and stomachs were analyzed. T. bellirica significantly (P<0.01) decreased carrageenan-induced paw edema; it exhibited a reduction of 50.00%, 55.88% and 61.76% at doses of 50, 120 and 300 mg/kg respectively. The methanolic extract also disclosed a good protective effect against ethanol-acid induced gastric mucosal injury in the rats. Oral administration of the extract`s doses (100, 250 and 500 mg/kg) demonstrated a significant (P<0.05) reduction in the ethanol- acid-induced gastric erosion in all the experimental groups when compared to the control. 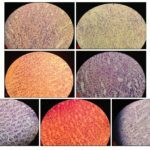 These findings were further supported by the histological study. The study clearly shows that methanolic extract of T. bellirica leaf possesses potent anti-inflammatory activity and promotes ulcer protection as ascertained by regeneration of mucosal layer and substantial prevention of the formation of hemorrhage and edema. INTRODUCTION: Inflammatory diseases are one of the major health problems worldwide. Acute and chronic inflammations are induced by several chemical mediators such as prostaglandins, leukotrienes and platelet-activating factor. Anti-inflammatory agents show their activities through several activity mechanisms. Non-steroid anti-inflammatory drugs (NSAIDs) are the most prescribed drugs for the treatment of inflammatory diseases. The NSAIDs provide the patients with symptomatic relief; however, they do not modify the pathogenesis of inflammation. Healing with medicinal plants is as old as mankind itself. Ever since ancient times, in search of rescue for their disease, the people looked for drugs in nature. The beginnings of the medicinal plant's used were instinctive, as is the case with animals 4. Because at the time there was not sufficient information either concerning the reasons for the illnesses or concerning which plant and how it could be utilized as a cure, everything was based on experience 5. Many of the herbs and spices used by humans to season food also yield useful medicinal compounds 6. Terminalia bellirica (TB) Roxb. is an herbal drug currently undertaken in this study primarily to explore its anti-inflammatory and anti-ulcerogenic potential in animal models. Terminalia bellirica Roxb. belonging to the family Combretaceae, commonly known as myrobalan, is a large deciduous tree found throughout the forests and plains. This tree is commonly found in Indian forests, Bangladesh, Bhutan, Cambodia, Indonesia, Laos, Malaysia, Myanmar, Nepal, Sri Lanka, Thailand, Vietnam, N-Australia, and plains regions. They are thick brownish gray bark with shallow longitudinal fissures, attaining a height of between 20 and 30 m 7. The stem is straight, and the leaves are broadly elliptic clustered near the end of the branches. The flowers are simple, solitary in axillary spikes 8, 9. Terminalia has a remarkable diversity of growth forms including annual and perennial herbs, shrubs, climbers, floating aquatics, and pachycaulous succulents 10. The common names of the plant are Beach Almond, Baheda, Bohera, etc. 11 T. bellirica is a plant in the Ayurvedic tradition to be helped with a number of health conditions, including: abdominal and back pain, coughs and colds, conjunctivitis, diarrhoea and dysentery, fever, headache, heart disorders, inflammation, leprosy, pneumonia, sexually transmitted diseases, worms, wounds, haemorrhages, ulcers, and as a general tonic diabetes, urinary tract infections. Many others are still studied for their medicinal properties 12, 13. For medicinal purpose, the powder of dried bahera fruit is taken in dosage of 3-6 gm. For cough, cold and throat problems, it is taken with honey 14. The chemical constituents isolated from various parts of the plant include alkaloid, coumarin, flavones, steroids, tannins, glycosides, terpenoid, saponin, glucoside, ellargic acid, gallic acid, lignans have been recognized 24, 25, 26. Extracts of this herb have been proven to have therapeutic effects in many preclinical studies. T. bellirica has been reported to be an effective anti-inflammatory activity 15, hepatoprotective activity 16, anti-cancer activity 17, anti-ulcer 18, anti-microbial activity 19, anti-hypertensive effect 20, alloxan induced hyperglycemic and anti-oxidant activity 21, antipyretic activity 22, anti-diarrhoeal activity 23. In Bangladesh, T. bellirica gross all over the country. According to a previous study, the fruits part of this plant has been reported for its anti-inflammatory activity. Besides, it has been stated that the leaves of T. bellirica contain the amount of tannin, flavonoids, glycosides, steroids, glucoside, ellargic acid, gallic acid, lignans which possess significant activity against inflammation and ulcer activity against inflammation and ulcer. However, there were no reports on the anti-inflammatory and antiulcer effect of Terminalia bellirica regarding Bangladeshi species, which encouraged us to evaluate the anti-inflammatory and antiulcer activity of T. bellirica in rats. Because of the potentials of T. bellirica as a medicinal plant in Bangladesh, interest in this plant is justifiable to seek anti-inflammatory and antiulcer activities. Also, the effect of T. bellirica leave extract on inflammation, and gastric ulcer was also assessed histologically. Collection and Identification of Plant: The fresh plants of Terminalia bellirica were collected in the month of August-September 2016 from Jangalia, Gazipur and their identity were authenticated from the Bangladesh National Herbarium, Dhaka where a voucher specimen was deposited having different accession number which is given here in parenthesis: Terminalia bellirica (43779). Leaves of Terminalia bellirica were used for the experiments. Drugs and Chemicals: Ibuprofen and omeprazole were obtained from the pharmaceutical industry Eskayef Bangladesh Limited. Carrageenan was obtained from Sigma Aldrich Chemicals, Germany. All other chemicals were obtained from Merck (Darmstadt, Germany) and were of analytical grade. Preparation of Plant Material for Extraction: The collected plants were washed properly, and then the leaves are separated carefully from the plant without contaminated by the seeds. The separated leaves are sundried. The dried leaves were ground and made into coarse powder from Pharmacognosy and Phytochemistry Lab of Primeasia University. Extraction Procedure: About 150 gm of coarse powder is soaked by 95% methanol (700 ml) in a conical flask and plugged with cotton and then covered with aluminum foil for seven days with constant stirring with a glass rod. After seven days the preparation was filtered, and the filtrate was collected to prepare the extract. The filtrate was evaporated by rotary evaporator and kept in normal air for a few days so that the remaining parts of the solvent get evaporated. The residue was then collected and weighed (20 gm). Then the residue was stored in a closed container. Phytochemical Analysis: Phytochemistry is the branch of chemistry deals with the chemical nature of the plant or plant products (chemistry of natural products). Plants contain many chemical constituents which are therapeutically active or inactive like carbohydrates, triterpenoids, alkaloids, glycosides, tannins, flavonoids, essential oils, and other similar secondary metabolites. The qualitative chemical tests are to be performed for establishing a profile of a given extract for its nature of chemical composition 27. Molisch’s Test: 2 ml of extract 2-3 drops of alpha naphthalene solution in alcohol was added, shaken for 2 min and 1 ml of concentrated sulphuric acid was added slowly from the sides of the test tube. A deep violet color at the junction of two layers indicates the presence of carbohydrates. Benedict’s Test: Equal volume (2 ml each) of Benedict‘s solution and extracts were mixed in a test tube and heated in boiling water bath for 10min the changes in color to yellow, green and red indicates the presence of reducing sugars. 5 ml extract was shaken vigorously with 5 ml of water and observed for persistent foam, which is stable for 15 min indicates the presence of saponins. In 5 ml extract few drops of olive oil was added which formed a soluble emulsion, confirming the presence of saponins 28. Mayer’s Test: To 3 ml of the extract, 1 ml of Mayer‘s reagent (mercuric potassium iodide) was added. The appearance of white precipitate indicates the presence of alkaloids. Hager’s Test: To 2 ml of extract, and add few drops of Hager‘s reagent (saturated picric acid solution) was added. The appearance of yellow precipitate indicates the presence of alkaloids 29. Liebermann’s Test: 2 ml extract, 2 ml chloroform and 2 ml acetic acid were added. A color change from violet to blue to green confirming the presence of glycosides 28. Salkowski Test: 2 ml of extract was added to 2 ml of chloroform. Concentrated sulphuric acid 2-3 drops were carefully added to form a layer. A reddish-brown coloration of the interface indicates the presence of terpenoids. Salkowski’s Test: 2 ml of extract was treated with 2 ml of chloroform, and an equal amount of concentrated sulphuric acid was added. The reddish ring at the junction indicates the presence of the steroids 28. Lead Acetate Solution Test: Test solution when treated with few drops of lead acetate (10%) solution would result in the formation of the yellow precipitate. Ferric Chloride Test: Test solution when treated with few drops of ferric chloride solution would result in the formation of blackish red color indicating the presence of flavonoids 29. Braymer’s Test: 2 ml of extract, 2 ml of distilled water and 5% of 2-3 drops of ferric chloride solution were added. The green color precipitate indicates the presence of tannins 28. Borntrager Test: 3 ml of extract, 3 ml benzene and 5 ml 10% ammonia solution were added. Red, pink or violet color produced indicates the presence of anthraquinone 29. Test for Coumarins: In a test tube 2 ml of extract and 10% 3 ml NaOH were added. Yellow color indicates the presence of coumarins 28. Experimental Animal: Female Albino wistar rats weighing between 120 to 150 gm were used. The rats were collected from the Pharmacy department of Jahangirnagar University. They were housed in polypropylene cages in groups of six rats per cage and were kept in a room maintained at 25 ± 2 °C with a 12 h light-dark cycle, and were allowed to acclimatize for one week before the experiments. They were given free access to standard laboratory animal feed and water ad libitum. They fasted overnight before the experiment. All surgery was performed under isoflurane (5% in 100% oxygen) anesthesia, and all efforts were made to minimize suffering. Animal care and research protocols were based on principles and guidelines approved by the Guide for the Care and Use of Laboratory Animals (NIH publication No: 85-23, revised in 1985). 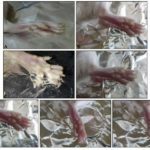 Induction of Inflammation in Rat Hind Paw and Experimental Design: The anti-inflammatory activity of methanolic extract of T. bellirica (METB) was assessed as suggested by Winter et al., 1962 by using carrageenan as edematogenic agent on adult Albino rat 30, 31. There were eight groups each containing six rats in them. Ibuprofen (20 mg/kg) was used as reference standard. The extracts were administered orally in the form of a suspension with 2 to 3 drops of tween 80 at dose levels of 50, 120 and 300 mg/kg respectively in the treatment group. The normal healthy group received distilled water only, and the per se group received 300 mg/kg extract similarly. All the test samples were administered orally (0.5 ml) 30 min before injection of carrageenan (0.1 ml of 1% w/v solution in distilled water) in the sub planted region of the left paw of each rat. However, the control and the per se group received no injection. The paw swelling was measured by slide calipers in every one-hour interval. The observations are tabulated. The percentage inhibition of paw edema was calculated at the end of 5 h. The animals were divided into the following groups and received following treatment can be tabulated. Where, Pt = paw thickness at time t, Po = Initial paw thickness, PC = Increase in paw thickness of control group and PT = Increase paw thickness of the treatment groups 32. Histological Evaluation: For histopathological examination, paws were collected 5 h after the induction with carrageenan. The tissue slices were immediately fixed in freshly prepared 10% neutral buffered formalin at 4 °C. Then, tissue specimens were processed for paraffin embedding tissue sections (5 μm thick). After that histological evaluation of inflamed paw, tissue was done from Exim Bank Hospital Department of Histopathology. Induction of Ulcer: They were fasted for 24 h before the experiment but were allowed free access drinking water for around two hours before the experiment. During the fasting period, the rats were placed individually in separate cages to prevent coprophagy. Group 1 rats were normal control and received 5 ml/kg distilled water without induction of ulcer. These rats were sacrificed 90 min later and their stomachs were immediately excised. Each stomach was opened along the greater curvature, washed with distilled water and fixed in 10% buffered formalin. Group 2 rats were negative controls that received 5 ml/kg distilled water orally; whereas, Group 3 rats received oral doses of 20 mg/kg omeprazole in as positive controls. Group 4, 5 and 6 rats received oral doses of 100, 250, 500 mg/kg of the methanolic extract by the same route, respectively. Thirty minutes after pre-treatment, gastric ulcers were induced with ethanol-acid in these groups of rats (25 ml per kg of 0.3M HCl in 60 percent ethanol). The rats were sacrificed 60 min later and their stomachs were immediately excised. Each stomach was opened along the greater curvature, washed with stilled water and fixed in 10% buffered formalin 33. Histological Investigation: At the end of the studies animals were sacrificed while they were under isoflurane (5% in 100% oxygen) anesthesia. For histological examination, paw tissues were taken 6 h after edema was induced by carrageenan. 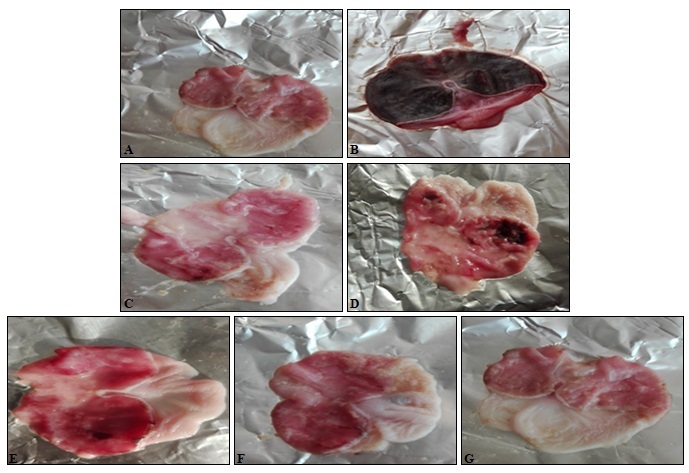 The tissue slices were immediately fixed in freshly prepared 10% neutral buffered formalin for a minimum of 24 h. On the other hand, specimens of the gastric walls from each rat were kept in 10% examination following the assessment of ulcer score for anti-ulcer activity. Then the tissue specimens were processed for paraffin embedding tissue sections. The samples were sectioned with a microtome, stained with hematoxylin and eosin (H and E) and mounted on Canada balsam. All sections were examined under a light microscope. Photographs of the lesions were taken with an Olympus photomicroscope for observation and documentation of histopathological changes such as edema, inflammation, infiltration, and erosion. Statistical Analysis: The values are represented as mean ± S.E.M, and statistical significance between treated and control groups was analyzed using of One way ANOVA, followed by Dunnett’s test where P<0.05 was considered statistically significant. Qualitative Phytochemical Analysis: The traditional use of the species is scientifically validated through the identification of the phyto-compounds responsible for their use in indigenous systems of health care. The results of qualitative chemical analysis of the methanolic extract of T. bellirica is tabulated in Table 1. Carrageenan-Induced Acute Inflammation: The anti-inflammatory potential of methanolic extract of leaves of T. bellirica was studied in carrageenan-induced acute inflammation using ibuprofen as a reference drug. Animals treated with ibuprofen (20 mg/kg, p.o.) and methanolic extract (50, 120 and 300 mg/kg p.o.) showed the significant reduction in paw thickness from 1 to 5 h Table 2; Fig. 1. The results obtained indicate that at the end of the study, the extract showed significant anti-inflammatory activity in inflamed rats when compared with carrageenan control (Figure). At the end of the study, ibuprofen (20 mg/ kg) treated group showed 81.17% of inhibition. Oral administration of methanolic extract at the doses of 50, 120 and 300 mg/kg reduced paw edema 50.00, 55.88 and 61.76%, respectively when compared with control group at 5 h after carrageenan injection. Histopathological Evaluations of Paw Tissue: Fig. 2A showed a section from the rat paw received only distilled water without carrageenan injection. The tissue architecture was preserved, showing dermal collagen and a minimal number of leukocytes. Fig. 2B demonstrated the carrageenan-induced section, elicit migration of numerous inflammatory cells throughout the section was observed. FIG. 1: EFFECT OF METHANOLIC EXTRACT OF T. BELLIRICA ON CARRAGEENAN INDUCED EDEMA AFTER 5 h. A = Healthy control, Which indicates: no erythema and inflammation were observed. B = Carrageenan control, which indicate severe erythema and swelling were observed. C = ibuprofen 20 mg/kg: the mild amount of erythema and swelling were observed. D = 50 mg/kg methanolic extract of T. bellirica: which indicate a moderate amount of erythema and swelling were observed. E = 120 mg/kg methanolic extract of T. bellirica: which indicate moderate amount of erythema and swelling were observed. F = 300 mg/kg methanolic extract of T. bellirica: which indicate a mild amount of erythema and swelling were observed. G = 300 mg/kg methanolic extract of T. bellirica without carrageenan. HC- Healthy control, CC- Carrageenan control, IP-20 – ibuprofen 20 mg/kg/day, METB-50 -methanolic extract of T. bellirica 50 mg/kg, METB-120- methanolic extract of T. bellirica 120 mg/kg, METB-300 - methanolic extract of T. bellirica 300 mg/kg/day, per se- methanolic extract of T. bellirica 300 mg/kg without carrageenan. On the other hand, ibuprofen (20 mg/kg) treated group revealed the appearance of only a few inflammatory cells Fig. 2C. 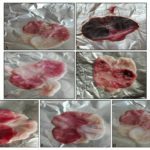 However, groups treated with a methanolic extract of T. bellirica at doses of 50 and 120 mg/kg displayed moderate to a minimal number of inflammatory cell infiltration Fig. 2D, 2E, respectively. The inflammatory cells’ infiltration was almost completely reduced by the treatment with a methanolic extract of T. bellirica at the dose of 300 mg/kg when compared with CC group Fig. 2F. And 2G = 300 mg/kg methanolic extract of T. bellirica without carrageenan. Ethanol-Induced Gastric Ulcer: In negative control animal, oral administration of ethanol produced characteristic lesions in the glandular portion of rat stomach which appeared as elongated bands of thick, black & dark red lesions. METB has shown significant protection index of 53.53%, 63.39 and 75.36% with the dose of 100, 250 and 500 mg/kg respectively in comparison to the negative control, omeprazole as standard reference drug was a reduction of ulcer 73.95%. Results are tabulated in Table 3. METB- methanolic extract of T. bellirica. Each value is Mean ± S.E.M (n=6). (*) indicates statistically significant difference from the respective group using one way analysis of variance, followed by Dunnett’s multiple comparison tests (*P< 0.05 and **P< 0.01). a = when compared with normal control, b = when compared with negative control. Gross Evaluation of Gastric Lesions: Negative control rats exhibited severe mucosal injury whereas, pre-treated with T. bellirica leaf extracts before being given ethanol had significantly reduced areas of gastric ulcer formation with showing a flattening of gastric mucosal folds compared to rats pre-treated with only distilled water. There were no significant differences between 250 and 500 mg/kg leaf extract in terms of ulcer area. It was also observed that protection of gastric mucosa was more prominent in rats pre-treated with 500 mg/kg leaf extract. Histological Evaluation of Gastric Lesions: Fig. 4G showed a section from the received only distilled water without induction of ulcer. The section of the gastric mucosal layer showed normal tissue architecture and absence of gastric tissue degeneration. Whereas, negative control group shows mucosal degeneration, ulceration, and migration of numerous inflammatory cells throughout the section. 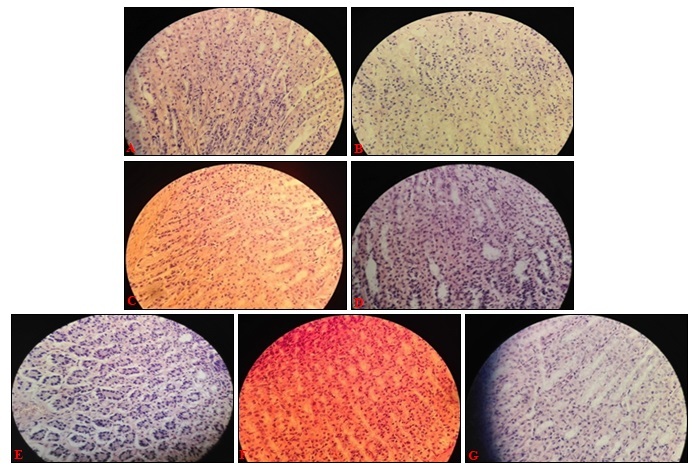 However, administration of omeprazole (20 mg/kg) showed no significant change in histopathology and showed regeneration and prevents the formation of hemorrhage and edema. METB at the dose of 100 mg/kg showed moderated regeneration. On the other hand, METB at the doses of 250 and 500 mg/kg showed significant regeneration of the mucosal layer and significantly prevents the formation of hemorrhage and edema Fig. 4E, 4F respectively. FIG. 4: HISTOLOGICAL EVALUATION OF ANTI-ULCER EFFECT OF METHANOLIC EXTRACT OF T. BELLIRICA. A) Normal control, B) Ethanol control, C) 20 mg/kg omeprazole, D) 100 mg/kg methanolic extract of T. bellirica, E) 250 mg/kg methanolic extract of T. bellirica, F) 500 mg/kg methanolic extract of T. bellirica & G) 500 mg/kg methanolic extract of T. bellirica without ethanol. DISCUSSION: On the phytochemical screening, the methanolic extract of T. bellirica showed the presence of alkaloids, phenols, steroids, triterpenoids, flavonoids, and coumarins. Some scientific studies have reported that certain terpenoids, steroids and phenolic compounds (tannins, coumarins, and flavonoids) have protective effects due to their antioxidant properties. The most widely used primary test for screening of anti-inflammatory agents is carrageenan-induced rat paw edema method 30. Carrageenan is the phlogistic agent of choice for testing anti-inflammatory drugs as it is not known to be antigenic and is devoid of apparent systemic effects. The development of edema in the paw of the rat after injection of carrageenan is believed to be a biphasic event. The initial phase observed during the first hour is attributed to the release of histamine and serotonin; the second phase is due to the release of prostaglandin-like substances 34. All these mediators include prostaglandins, histamine, bradykinins, leukotrienes and serotonin, which cause pain and fever 35. Recently, some natural products or ingredients of traditional medicines and healthy foods have been extensively investigated and subjected to clinical trials as anti-inflammatory agents. Presence of major phytoconstituents in the methanolic extract of leaves of T. bellirica makes it a potential candidate for further investigation. Fig. 2A showed a section from the rat paw received only distilled water without carrageenan injection. The preservation of tissue architecture showing dermal collagen and a minimal number of leukocytes. Fig. 2B demonstrated the carrageenan injection induced migration of numerous leukocytes, main neutrophils throughout the section whereas ibuprofen (20 mg/kg) treated group showed only minimal inflammatory cells Fig. 2C. On the other hand, methanolic extract of T. bellirica treated groups at doses of 50, and 120 mg/kg showed moderate to the minimal number of inflammatory cell infiltration Fig. 2D and E, respectively) whereas inflammatory cells infiltration was almost completely reduced by the treatment with the methanolic extract of T. bellirica at a dose of 300 mg/kg when compared with CC group Fig. 2F. However, oral administration of a methanolic extract of T. bellirica at 300 mg/kg without carrageenan showed no infiltration of inflammatory cells Fig. 2G. In our study, the histopathological examination of the hind paws disclosed that methanolic extract of T. bellirica suppressed the massive influx and accumulation of inflammatory cells in the paw tissue after carrageenan challenge. The suppressive effects were observed at all doses of the test drugs. However, the present investigation concluded that methanolic extract of T. bellirica reduced the inflammatory cells infiltration, in a dose-dependent manner and at the higher dose the effect is similar to that of a reference drug. An ulcer is caused due to imbalance aggressive and defensive factors of the gastric mucosa. 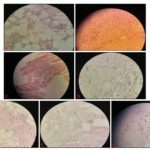 Pepsin and gastric acid make up the offensive factors whose proteolytic effect is buffered by mucin secretion, mucosal glycoprotein, cell shedding, cell proliferation, and prostaglandin. Different therapeutic agents including plant extract are used to inhibit the gastric acid secretion or to stimulate the mucosal defense mechanism by increasing the mucus production protecting the surface epithelial cells or interfering with the PG synthesis 36. The treatment and prevention of these acid-related disorders are accomplished either by decreasing the level of gastric acidity or by enhancing mucosal protection 37. The present study was carried out to investigate the antiulcer activity of methanolic extract of Terminalia bellirica in ethanol-induced ulceration in the rats model. The results revealed that the ethanol administration in the negative control group resulted in massive ulcer formation (P<0.01) in comparison with the normal group. However, pre-treatment with omeprazole at the dose of 20 mg/kg and methanolic extract of T. bellirica at the doses of 100 250 and 500 mg/kg showed significant inhibition (P<0.01, P<0.05, P<0.01 and P<0.01, respectively). Among the test drugs, the best result was obtained with T. bellirica at an optimum dose of 500 mg/kg which was potentially effective as compared with a standard drug, omeprazole. 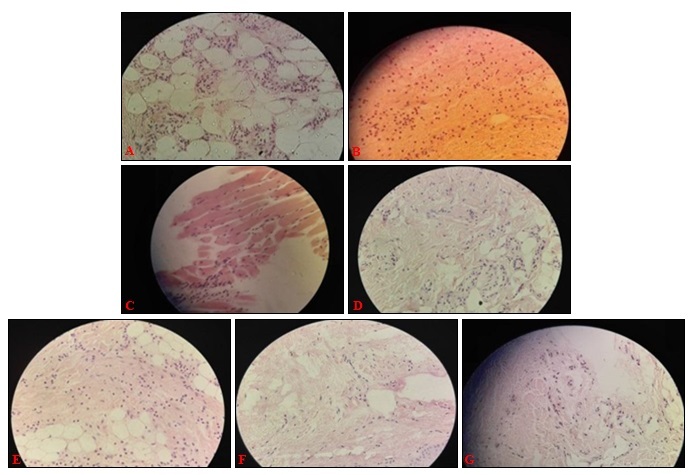 In the present study, the histopathological examination of the stomach disclosed that oral administration of T. bellirica suppressed the massive degeneration and accumulation of inflammatory cells in the gastric mucosal layer after ethanol challenge. The suppressive effects were observed at all doses of the test drugs. So, the findings observed in the current studies support and extend previous results that reported the anti-inflammatory and anti-ulcer activities of T. bellirica of leave extract, respectively. Furthermore, the present studies also revealed a better inhibition of inflammation and gastric ulcer as compare to the previously reported. CONCLUSION: The results of the present study expose that the plant has quite some chemical constituents like alkaloids, phenols, steroids, triterpenoids, flavonoids, and coumarins, which may be responsible for many pharmacological actions. Although, their specific roles were not investigated in this study. The plant also contains saponin which is used to stop bleeding and in treating wounds and ulcers as it helps in red blood cell coagulation. Alkaloid has numerous functions and among the foremost is their analgesic, antispasmodic and bacteriological effects. Presence of phytochemical components like alkaloid, terpenoids, coumarins, and steroids may have good anti-inflammatory activities and antibacterial activity 32. On the other hand, the phytochemical investigation suggested that several species of Terminalia were found to exhibited anti-ulcer activity 38. Phytochemical investigation of this medicinal plant revealed the presence of ellagic acid and gallic acid. Ellagic acid, a widely occurring polyphenol possesses strong antioxidant activity. It has a marked inhibitory effect on acid secretion and the occurrence of the stress-induced gastric lesion, and these effects may be attributed to the inhibition of H+ and K+ATPase activity 39. The experimental model shows good anti-inflammatory activity at dose 50,120 and 300 mg/kg. This study was conducted to evaluate the antiulcer activity of the T. bellirica. We observed the gastroprotective activity of the T. bellirica leaf extract against ethanol- acid induced gastric mucosal injury in rats. From the summary of our studies, it can be concluded that T. bellirica has potent anti-ulcer activity and anti-inflammatory activity. These results suggest that methanolic extract of the leaves of T. bellirica can be used for isolation of novel bioactive compounds in ethnomedicinal and development of potential drugs. However, further investigation of this plant is needed. ACKNOWLEDGEMENT: We are thankful to Department of Pharmacy, Primeasia University, Dhaka-1213, Bangladesh, and we are also grateful to the Exim Bank Hospital for providing histopathological photographs of paw tissue and stomach of the rats. Meggs and William J: Svec, Carol: The Inflammation Cure”. McGrawHill: New York 2004: 51. Available from (https://www.bookdepository.com/Inflammation-Cure-William-Joel-Meggs/97800714). Ariyphisi I, Toshiharu A, Sugimura F, Abe M, Matsuo Y and Honda T: Recurrence during maintenance therapy with histamine H2 receptors antagonist in cases of gastric ulcers. Nikon Univ J Med 1986; 28: 69-74. Campos MM, Mata LV and Callxto Expression of B1 kinin receptors mediating paw edema and formalin-induced nociception. Modulation by glucocorticoids. Can J Physiol Pharmacol 1995; 7: 812-9. Stojanoski N: Development of health culture in Veles and its region from the past to the end of the 20th Veles: Society of Science and Art 1999: 13-34. Kelly KL History of medicine. New York: Facts on file 2009: 29-50. Bojadzievski P: The health services in Bitola through the centuries. Bitola: Society of Science and Art 1992: 15-27. Chaudhary GP: Wound healing activity of the ethanolic extract of Terminalia bellirica fruits. Nat Prod Redian2 008; 7(1): 19-21. Nadkarni AK and Nadkarni KM: In; Indian Materia Medica, Popular Prakashan, Bombay, Vol. I, 1982: 1202. Handa SS and Kapoor VK: Pharmacognosy Vallabh Prakashan; New Delhi, Edition 2nd, 2002: 222. McGaw LJ, Rabe T, Sparg SG, Ja ¨ger AK, Ejoff JN and van Staden J: An investigation on the biological activity of Combretum species. J Ethnopharmacol 2001; 75: 45-50. Mallik J, Das P, Karon B and Das S: A review on phytochemistry and pharmacological activity of belerica. International Journal of Drug Formulation and Research 2012; 3(6): 1-5. Trease GD and Evans WC: Pharmacgnosy, Harcourt Brace and Company, Edition 15th, 1997: 226 & 472. Kadian R, Parle M and Yadav M: Therapeutic potential and phytopharmacology of Terminalia bellirica. World Journal of Pharmacy and Pharmaceutical Sciences 2014; 3(10): 804-806. Saraphanchotiwitthaya A, Sripalakit P and Ingkaninan K: Effects of Terminalia bellirica methanolic extract on mouse immune response in-vitro. Maejo Int J of Sci and Tech 2008; 2(2):400-7. Shukla S, Jadon A and Bhadauria M: Protective effect of Terminalia bellirica , and gallic acid against carbon tetra chloride induced damage in albino rats. Journal of Ethanopharmacology 2006; 109: 214-218. Pinmai K, Chunlaratthanabhorn S, Ngamkitidechakul C, Soonthornchareon N and Hahnvajanawong C: Synergistic growth inhibitory effects of Phyllanthus emblica and Terminalia bellirica extracts with conventional cytotoxic agents: Doxorubicin and cisplatin against human hepatocellular carcinoma and lung cancer cells. World J Gastroenterol 2008; 14(10): 1491-97. Choudhary GP: Anti-ulcer activity of the ethanolic extract of Terminalia bellirica Int J of Pharmaceutical and Chemical Sci 2012; 1(4): 1293-97. Khan AU and Gilani AH: Pharmacodynamic evaluation of Terminalia belerica for its anti-hypertensive effect. Journal of Food and Drug Analysis 2008; 16: 6-14. Sabu MC and Kuttan R: Anti-diabetic and Anti oxidant activity of Terminalia bellirica Indian Journal of Experimental Biology 2009; 47: 270-275. Sharma SU, Sharma US, Singh A, Sutar N and Singh PJ: Screening of Terminalia bellirica fruits extracts for its analgesic and antipyretic activities. Jordan J of Bio Sci 2010; 3(3): 121-4. Kumar B, Divakar K, Tiwari P, Salhan M and Goli D: Evalution of the anti-diarrhoeal effect of aqueous and ethanolic extracts of fruits pulp of Terminalia bellirica In Rats. International Journal of Drug Development and Research 2010; 2(4): 769-779. Singh A: Medicinal Plants of the World, Published by Mohan Primlani for Oxford and IBH Co. Pvt, New Delhi, 2006: 26. The Ayurvedic Pharmacopoeia of India, 1stedition, published by the controller of Publications, Civil Lines, New Delhi, Vol. 01, Part-1, 2001: 252. Saroya AS: Herbalism phytochemistry and Ethanopharmacology. Science Publishers 2011: 357-361. Kokate CK, Purohit AP and Gokhale SB: A textbook of pharmacognosy. Nirali Prakashan, Pune, 20087: 2005; 145-190. Yadav M, Chatterji S, Gupta SK and Watal G: Preliminary phytochemical screening of six medicinal plants used in traditional medicine. Int. J Pharm Pharm Sci 2014; 6(5): 539-542. Harborne JB: Phytochemical Methods. Chapman & Hall. London 1999: 60-66. Winter CA, Rmley EA and Noss GW: Carrageenan-induced edema in hind paw of the rat as an assay for anti-inflammatory drugs. Experimental Biology and Medicine 1962; 111(3): 544-547. http://dx.doi.org/10.3181/00379 727-111-27849. Crunkhorn P and Meacock SCR: Mediators of the inflammation induced in the rat paw by carrageenin. Br J Pharmacol 1971; 3: 392-402. Das P, Mekap S, Pani S, Sethi R and Nayak P: Pharmacological evaluation of anti-inflammatory activity of Euphorbia hirta against carrageenan-induced paw edema in rats. Der Pharmacia Lettre 2010; 2(2): 151-154. Ganguly AK and Bhatnagar OP: Effect of bilateral adrenalectomy on the production of restraint ulcers in the stomach of albino rats. Can J Physiol Pharmacol 1973; 10: 748-50. Asongalem EA, Foyer HS, Ngogang J, Folefoc GN, Dimo T and Kamtchouing P: Analgesic and anti-inflammatory activities of Erigeron floribundus. Journal of Ethnopharmacology 2004; 91(2-3): 301- 308. http://dx.doi. org/10.1016/j.jep.2004.01.010). Goyal RK and Sairam K: Antiulcer drugs from indigenous sources with emphasis on Asparagus racemosus and Zingiber officinale. Indian Journal of Pharmacology 2002; 34: 100-110. Guyton and Hall: Textbook of Medical Physiology, Philadelphia, Edition 10th, 2000: 397 398. Gunasekhar D: Constituents of Terminalia pallida. Fitoterapia 1993; 64: 183. Murakami, S: Inhibition of gastric H+, K+ ATPase and acid secretion by ellagic acid. Planta Medica 1991; 57: 305-308. Akter S, Begum T, Begum R, Tonny TS, Yasmin M, Shifa S, Afroze F and Faruquzzaman: Phytochemical analysis and investigation of anti-inflammatory and anti-ulcer activity of Terminalia bellirica leaves extract. Int J Pharmacognosy 2019; 6(2): 54-65. doi link: http://dx. doi.org/10.13040/IJPSR.0975-8232.IJP.6(2).54-65.